The popularity of SUVs may be dwindling in the wake of the not so bygone economic crisis and the rising fuel prices elsewhere in the world. But no matter which way the economy tips or how expensive crude gets, SUVs are a big hit in India, and their sales continue unabated. Driving the SUV is making a statement that cannot be matched by a sedan. BMW seems to have understood this Indian lust for lifestyle vehicles and has responded in a way which will make premium car manufacturers sit up and reconsider their strategies. No one complains when they get more for less and that's just what the X1 is; it is more for less every way you look at it. SUVs are more expensive than sedans generally and now a premium SUV is cheaper than a premium sedan. BMW shook the whole premium car market by launching the X1 at ` 22 lakh ex-showroom. And BMW India president Andreas Schaaf made some bold remarks at the launch. He expects 80 per cent of X1 buyers to migrate to BMW from rival brands. (We do not wish to dispute this.) Schaaf also expects the X1 to be the highest volume generator for BMW in the coming years. We totally agree. At launch, BMW confirmed bookings of over 1000 X1 units and that was over a month ago. Consider the X1's direct competitors. Firstly there is the Honda CR-V of which the cheapest variant, the 2-litre, front-wheel-drive, manual transmission version is priced at ` 22.7 lakh (ex-showroom Mumbai). Comparing the CR-V and X1 is like comparing chalk and cheese. Indians don't hold the Japanese car makers in as hallowed a space as they do the Germans. A Honda stands no chance against a BMW in terms of brand perception and comparing these cars on technical aspects, the entry level CR-V looks weak when pegged next to the entry level X1. The 2.4-litre CR-V costs ` 24.5 lakh (ex-showroom, Mumbai) and that is the on-road price of the X1 petrol. The same is the case with the Hyundai Santa Fe which is priced at ` 22.7 lakh ex-showroom. It's not just the SUVs and the soft-roaders that the X1 is gunning for. We predict the sales of the Accord, the Camry and the Superb are going to be hit. And that goes for the Mercedes C-Class as well. With all the hype surrounding the X1, it becomes imperative that we subject it to a thorough road test. We have both the diesel and the petrol X1 variants, the X1 sDrive18i and the X1 sDrive20d Exclusive. At first the X1 confuses you. When you see it coming towards you it appears huge. The long and muscular bonnet with three different countours immediately gives the impression of a big SUV. To enhance the SUV stance is the huge kidney grille seen on all modern BMWs. Also, the front doesn't tuck back in and is relatively flat compared to the BMW sedans and that marks the X1 as a part of the 'X' family. But get closer to the X1, and you get a feeling of being hoodwinked. It isn't all that big and tall and SUV-ish after all. 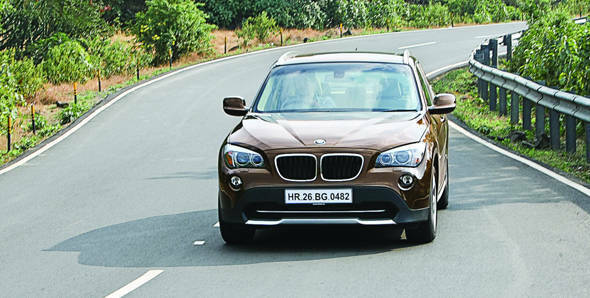 Though its design is in sync with the 'X' range of cars it doesn't share any underpinnings with the X5 or even the X3. The X1 is put together from a mixed bag of components from the 3 Series and the internationally available 1 series. In profile too it appears to have borrowed styling cues from the X series of cars with huge chunky doors, downward tapering roofline and a meaty D pillar. But you can't help but notice how short the X1 is. Our long-term WagonR is a couple of inches taller than the X1 parked side by side. This leads to an odd situation on the road. There you are driving an SUV and occupants in hatchbacks are either at eye level with you or worse, a couple of inches higher and looking down on you and the X1. Poor lowly me... At the rear you have an upward opening hatch flanked by good looking tail lamps that carry over to the hatch. The rear could be termed plain in context of design as there aren't many lines but it does its job - of making the X1 look good. There is only one badge which tells you that it's an X1. The variant badge is located on the front doors. The X1 has the same 2760mm wheelbase as the 3 Series but the overall width and the front and rear track is slightly narrower than the 3 Series. The entry level sDrive18i gets 17" tyres and five-spoke alloys while the top-of-the-line diesel, the sDrive20d Exclusive gets 19-inch tyres with slightly better looking five-spoke alloys. The usual halogen lamps are replaced by xenon lamps and corona rings on the top-of-the-line variant. The X1 looks stunning and garners a lot of attention wherever it goes, though I'm not sure if this will be the case when the X1 starts selling in huge numbers (which it will) and become a common sight on our roads; it certainly is a good looker. Nowhere else is the platform sharing with the 3 Series more obvious than on the inside. The layout and design is very similar to the 3 Series as is the initial impressions of space. The X1 does offer slightly more leg room in the front but at the back it's identical to the 3 Series. It is designed to seat five but the person sitting in the middle of the second row seat is going to have a tough time trying to fit in comfortably with the transmission tunnel taking up floor space. However, the X1 seats four passengers very comfortably and the additional head room lends an air of roominess to the car which you don't find in a 3 Series. The driver's seat offers a good overall view and the seat is electronically adjustable and finding the perfect seating position is never a problem. The Exclusive variant which costs almost nine lakh rupees more than the entry level petrol justifies that price tag by offering extra gizmos and leather interiors. What you get is the latest generation iDrive, an advanced communication package which lets you access your Bluetooth enabled phones call registry, view photos of contacts, display calendar, tasks, notes, text messages and manage audio controls on compatible phones. The Exclusive variant also offers a 6-CD in-dash changer while the entry level trim has a single CD player. The exclusive variant has leather interiors which are available in either beige/black, red brown/black and complete black. The entry level variant offers fabric interiors in complete black or black/beige with the panels having a high gloss finish. The Exclusive variant gets a fine wood finish and a panoramic sunroof. Parking (reverse only) sensors are standard across all variants. For those not about to splurge the additional eight lakh rupees on the top-of-the-line variant, let me assure you that the standard version has all the creature comforts you could ask of a premium car. The absence of the iDrive, panoramic sunroof and leather upholstery isn't a deal breaker. In fact, in India the sunroof adds to the air-conditioners stress and fabric works better in our climatic conditions in keeping you comfortable than leather. The X1 platform's similarities saga with the 3 Series don't end at the chassis and the interiors; even the engines on both these cars are similar and in the exact same state of tune. The sDrive18i has the same 2-litre petrol engine as on the 320i. Why did BMW choose to label this the sDrive18i and not the sDrive20i? I have no clue. This engine produces 156PS of max power at 6400rpm and 200Nm of torque at 3600rpm. The diesel variant gets the 2-litre direct injection engine with a variable geometry turbocharger as seen on the 320d. It churns out a maximum of 178PS at 4000rpm and 350Nm of maximum torque from a very low 1750-3000rpm. Both these engines are derived from BMW's EfficientDynamics program. The X1 uses brake regeneration technology which uses an intelligent energy management system that allows fewer components to draw power from the drivetrain as you brake and accelerate. The kinetic energy captured during braking is fed to the battery. This reduces the amount of power the battery takes from the engine, which lowers fuel consumption. During acceleration, the alternator is decoupled from the drivetrain so that more of the engine's output can go into accelerating the car. The result is a noticeable reduction in fuel consumption. The X1 doesn't get the xDrive system in India, it gets the sDrive only. What that means is that the X1 rolls off the factory as a rear-wheel-drive and all-wheel-drive is not even optional. So, going off-road in this car is not advisable. While the loss of additional drivetrain hardware translates into lesser weight and lesser moving parts and improved fuel economy, it also underlines how BMW wants this car to be more of a style statement than anything else. After all, how many X3 and the X5 owners do you think really take their beloved bimmers off the road? Exactly. The case would have been no different with the X1 and hence it's a very smart move by BMW. It helps keep the price down as well. Transmission duties are handled by a 6-speed automatic gearbox with a sport mode which allows you to shift manually. However, the gearbox doesn't hold on to the gear once you hit the redline and shifts appropriately. In terms of performance both these cars are poles apart. The smaller petrol engine fails to deliver that fun factor synonymous with BMW's six-cylinder engines and tends to dampen the spirit especially after you have just driven the diesel. With a power-to-weight ratio of just 75PS per tonne (as compared to the 112PS per tonne of the 320i) the petrol variant does feel comparatively sluggish on the highway when you floor the pedal. There is a lot of nice revving sound from the engine bay but the car makes very little progress. The petrol variant crosses the 60kmph mark in 6.17 seconds and the 100kmph mark in 13.53 seconds, that's almost 4 seconds slower than the 320i which has a similar engine. The X1 weighs 1530kg, 140kg more than the 320i and that is why it loses out on performance. In the city, the petrol tends to struggle a bit at times to keep the revolutions in the meaty band of the engine. Driveability is a moot point because it isn't you who needs to do all the shifting. The 6-speed automatic handles the shifting duties with minimal lag. With only 200Nm of torque available at a relatively higher rpm rules you out of any sink-into-the-seat acceleration. The top speed we managed was 192kmph though BMW claims it can do 200kmph Diesel mills are BMW's strong point here in India. Most of BMW's sales have been diesels and that's not a surprise considering BMW makes some seriously good diesel engines. We have raved about them in the past and though we are already done raving over this particular engine in our 320d test, it still makes a world of a difference when it comes to choosing one X1 over the other. If I were to buy an X1, it would be the diesel. It is worth every additional rupee of the 1.9 lakh extra over the petrol - not a bad deal at all. The diesel variant crosses the 60kmph mark in 3.98 seconds and 100kmph in 8.9 seconds which is just half a second slower than the 320d Highline. Really impressive, I must say considering the X1 diesel weighs 1575kg, 130kg more than the 320d Exclusive. It has a power-to-weight ratio of 127PS per tonne and the X1 has a power-to-weight ratio of 85PS per tonne. Both these engines feel very refined and smooth while being frugal. The petrol returns 19.2kmpl on the highway and 9.55kmpl in the city and an overall fuel efficiency of 11.9kmpl. The diesel returns 18.4kmpl on the highway and 11.3kmpl in the city with an overall mileage of 13kmpl. All the expectations of dynamic handling ability that loom over any car from the Bavarian stable are well met by the X1. However, the steering feels a bit vague; it's incredibly hard at slow speeds and unsettlingly light at high speeds, when it should have been the other way round. But regardless of this, the X1 feels superbly planted and relatively roll-free thanks to the stiff suspension. If BMW can make all its cars handle well, it can certainly ensure that the X1 follows suit. The X1 goes round corners as on rails and there is a hint of oversteer which is a result of this car being a rear-wheel-drive. This can be overlooked however as pushing a car hard round corners is not routine. However, hard cornering is where the xDrive would have helped. But there is a compromise to this handling and that is a ride that is slightly firm, allowing more vibration to seep into the cabin than you would like from a car like this. The shocks are further amplified in the top-of-the-line diesel which has 19-inch low profile tyres. The X1 is equipped with DTC (dynamic traction control) which is part of the DSC (dynamic stability control). While you can turn off the DTC via a switch on the dashboard, you cannot toggle the DSC settings so that means at no time can you turn off the traction control completely which means no sideways action for Bert. Off the road, the X1 is completely out of its comfort zone and the 194mm of ground clearance may seem a bit inadequate for extensive off-road use but it is higher than most soft-roaders you can find in India today. In fact, it's just 9mm less than the X3's ground clearance. The lack of a four-wheel-drive limits the X1 to road use only.